Overall, the 10-game VFL career of Jim Willis at Carlton was quite unremarkable - apart from the fact that his first two games in 1914 both ended in draws, and that afterwards he waited almost four years to experience the joy of victory. In a career interrupted by World War 1, Jim didn’t play for the Blues again until 1918, when he made a brief comeback that lasted another eight senior matches. Born in 1891, and raised in the Victorian western district town of Allansford, Willis later moved to Melbourne for its greater employment opportunities. He joined the MTOC (Melbourne Tramway and Omnibus Company) and spent much of his working life in that burgeoning industry. He also played football for Tramways in a popular Saturday morning league that flourished during the first decades of the century, and it was his ability there that saw him recruited by the 1909 VFA Premiers Brunswick. In 1914, as the world teetered on the brink of World War 1, Willis was invited to Princes Park, where his form as a follower during trial games gained him a place in Carlton’s team for the season opener against Collingwood at Victoria Park. Wearing guernsey number 9, Jim was one of six debutantes for the Blues in a match that the visitors dominated for three quarters, only for the home side to rally in the final term and fight out a thrilling draw. Carlton’s disciplinarian coach Norman Clark was far from pleased with that result however, and Willis was one of three players omitted from the side for round 2. He spent a fortnight on the sidelines, before being recalled for the vital match against ladder-leaders South Melbourne at the Lake Oval in round 4. This time, the game was an arm-wrestle throughout. The Blues trailed by three points at half-time, one point at the last break, and kicked 1.1 to 1.0 in a fierce last-quarter struggle that ended up all square at the final bell. From that point on, Willis didn’t play again for Carlton for four years. When war was declared in August 1914, those who operated and maintained the public transport network were designated as having reserved occupations, and were discouraged from leaving their jobs to join the military. It is likely that Willis fell into this category. He is recorded as playing for Northcote in 1915 before the Association went into recess during 1916-17, and was probably sweating with anticipation when Carlton invited him back to Princes Park in 1918. In guernsey number 16, Jim resumed his career as a Bluebagger in round 1, 1918, and perhaps experienced a sense of deja-vu when the Carlton side travelled to Victoria Park to take on Collingwood once more. As had happened in the corresponding game in 1914, the Blues were the better side during the first half, only this time they wilted when the whips started cracking. The Pies kicked 7.7 to 1.3 after the main break, and won by 30 points. 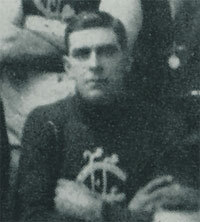 Willis kicked his first - and only – career goal the following week against Richmond, then celebrated his maiden victory at long last when Carlton beat St Kilda by 26 points in round 3 at Princes Park. Jim had waited 3 years, 11 months and 21 days for that moment, and things got even better when his next five matches produced four wins. However, even as the Blues enhanced their finals credentials, Jim was quietly omitted after a big win over Essendon at Princes Park in round 11. By then he had probably realised, or had been told that his time was up. He departed from Princes Park before season’s end, and his subsequent exploits on the football field are not known. Jim passed away at Coburg on the 14th September, 1980 - the day after his 89th birthday. Contributors to this page: Bombasheldon , molsey , PatsFitztrick , tmd1 , true_blue24 , Jarusa and admin . Page last modified on Sunday 02 of June, 2013 11:22:04 AEST by Bombasheldon. 1974 - Syd Jackson's wish for a Barassi smile (pg 3 of 3).